For more than three decades, fistula surgeon Dr. Thomas Raassen has been traveling the globe, changing the lives of suffering women. He has very likely performed fistula surgeries in more countries than any other surgeon in the world. Originally from Amsterdam, Dr. Raassen lived in Kenya for many years, and has operated in more than 60 hospitals across Africa and Asia. He has performed thousands of fistula surgeries, and is considered one of the foremost experts in the field. Fistula Foundation is proud to support Dr. Raassen’s important work. 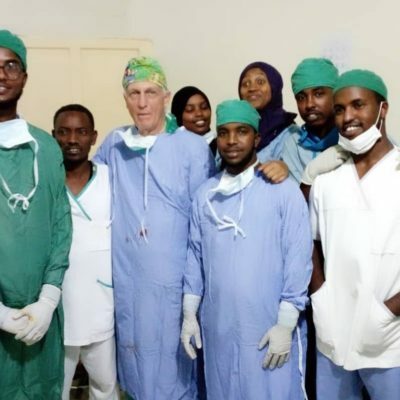 Recently, he visited our partners at the National Borama Fistula Hospital in Somaliland, and provided life-changing surgeries for 32 women in need. Dr. Raassen, thank you for your lifelong dedication to women with fistula! National Borama Fistula Hospital in Somaliland. This story originally appeared in the Fall 2018 edition of our newsletter, Transformations.